In this article a pic16f88 is used to send the string "hello, world!" to a computer via serial cable. For this MCU, the Addressable Universal Synchronous Asynchronous Receiver Transmitter (AUSART) mode will be used. As usual, specifics such as register names will more or less only apply to the pic16f88 and xc8, although most MCUs with a UART module will have a similar implementation. To enable serial communication, the pins on the MCU must be set, as well as configuring the correct registers. To enable AUSART, bit SPEN = 1 (part of the RCSTA register) must be set. Send and receive operations are configured using RCSTA and TXSTA, registers respectively. These registers are used for both "synchronous" and "asynchronous" modes, so the meaning of some bits depends on which mode. To begin, we only need to look at the transmit register, TXSTA. We will be transmitting in asynchronous mode, that is, SYNC = 0. In this mode, SPBRG sets the baud rate. 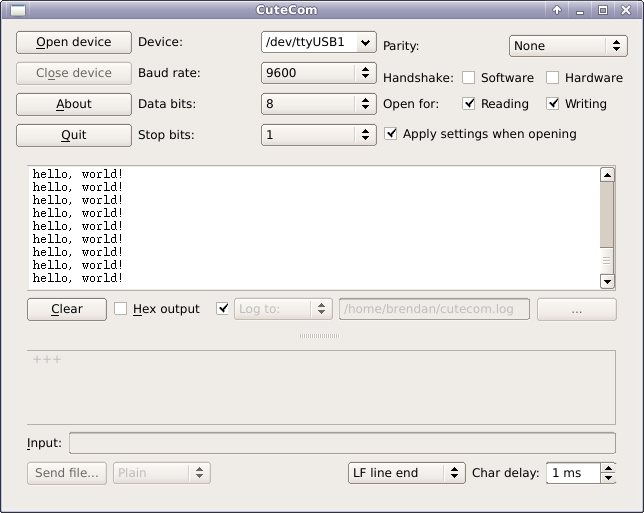 Thus, to send 8-bit data to a computer in async mode at 9600 baud, TXSTA = 0b00100100. Now that the MCU is initialised to send data, we look at packaging and transmitting the data itself. Data is transmitted serially in bytes (in C, this is of type char or short). Bytes may be printed in any format: ASCII, decimal, hexadecimal, binary etc. For this exercise, plain text will be transmitted one ASCII character at a time. 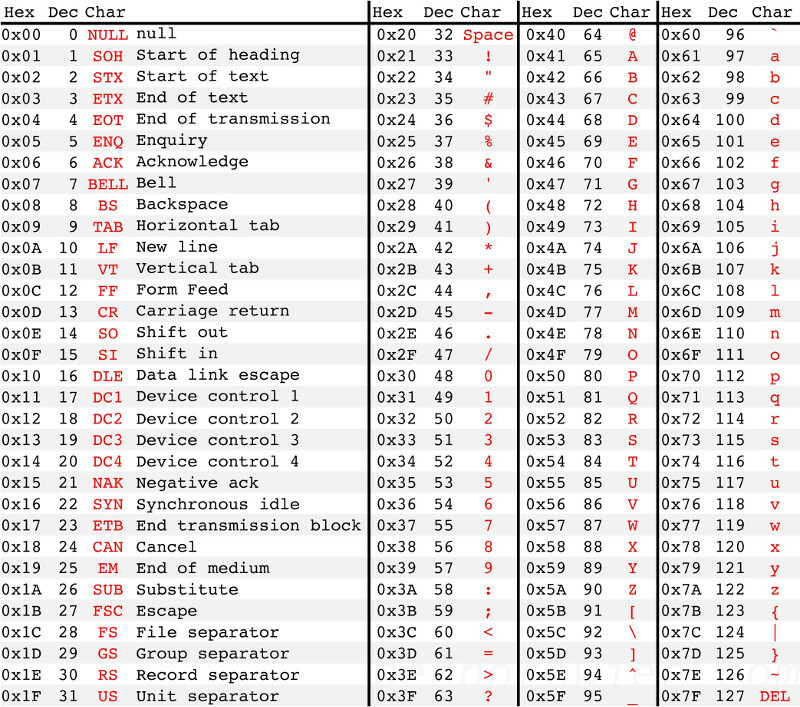 Note that the ASCII table only goes up to 127 (0x7f), higher values (128-255) cannot be represented (see Figure 1). Normally, sprintf would be used to represent an integer as a string. However, lacking this library, integers were converted to strings by first splitting them into individual digits, then converting each digit into its corresponding ASCII value. So, for example, the string "1 25\n" may be represented by the bytes "0x30 0x20 0x32 0x35 0x0A". Data is transmitted from TSR register. TRMT shows the status of the TSR register: TRMT = 1, TSR is empty, TRMT = 0, TSR is not empty. For 9-bit transmission (TX9 = 1) the ninth bit should be written to TX9D before writing the 8-bit data to TXREG. The onboard status LED flashed every time data was sent, which provided some kind of feeback as to whether the program was running. The first data sent, of course, was "hello, world!". This was output to a PC and viewd with a terminal emulator. The development board had a D9 serial port, so a usb-to-serial cable was needed. This cable had an ftdi chip, so the ftdi_sio serial driver was required under GNU/Linux. The terminal used was CuteCom. Unusually, there were no problems with this task, and the output from the serial link is shown in Figure 2. Serial data was transmitted from a pic16f88 dev board to a PC via a serial cable.